Successful in a wide variety of liquid and gas applications, including filling applications and continuous batching processes, the Kates Automatic Flow Rate Controller has the ability to maintain a constant flow rate during pressure fluctuations. 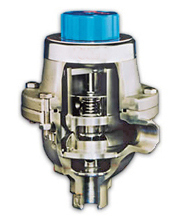 The Kates Flow Control valve successfully replaces a typical flow control set-up consisting of a modulating valve, flow meter and controller assembly. 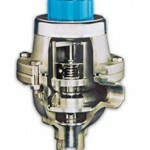 The Kates FC valve is a high quality, high performance unit that provides many years of maintenance free service. Flow rate through an orifice is proportional to the size of the restriction and the differential pressure across it. By combining an adjustable orifice with an internal regulating valve, the Kates valve will maintain a constant pressure drop across the metering orifice. The simplicity of its design begins with the Internal Differential Regulating Valve, the (IDRV), which is free to move inside the Kates unit and is attached with a spring. When fully extended the IDRV will cover the exit port. 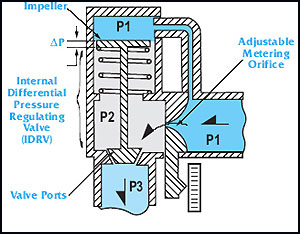 When the inlet pressure is applied, the top of the impeller sees the upstream pressure, P1 and is forced down. Subsequently, fluid flows through the metered orifice, resulting in an internal pressure, P2. Further pressure is dropped across the exit orifice resulting in the discharge pressure, P3. The IDRV is in equilibrium when the upstream pressure is reacted by the internal pressure plus the force of the spring. If the internal pressure is too low, then the IDRV will move down decreasing the area of the exit port. This will in turn increase the internal pressure. If the internal pressure is too high, then the IDRV will move up increasing the area of the exit port. This will in turn decrease the internal pressure. Thus the pressure across the impeller, as well as the metered orifice, is maintained to be constant. When the upstream pressure fluctuates, the internal pressure will adjust accordingly. When the downstream pressure fluctuates, the IDRV will adjust the size of the exit port to maintain the internal pressure. The flow rate can be adjusted by changing the area of the metered orifice. This is done through the control knob on the top of the valve. The Kates Controller, maintains your flow to within 1 ½% of the set point, regardless of pressure variations. Other material available upon request: Hastelloy, PVC, Alloy 20, Monel, etc. This entry was posted in Latest News, New Product Announcements, Specialty Products. Bookmark the permalink.